Francine's Friends: Do You Have YOUR Indiana IBCAT License Plate? Francine’s Friends will again be a recipient of a grant for breast cancer screening from the Indiana Breast Cancer Awareness Trust, Inc. (IBCAT). In 2016, IBCAT granted over $417,800 to 36 organizations dedicated to screening mammography programs, including Francine’s Friends. The mission of IBCAT is to increase awareness and improve access to breast cancer screening, diagnosis and support services throughout Indiana. IBCAT receives funds through sales of breast cancer awareness specialty license plate. Indiana Breast Cancer Awareness Trust plate sales began in January of 2002. Through these sales, monies are available for grants deemed to best address the unmet screening needs of the people of Indiana. 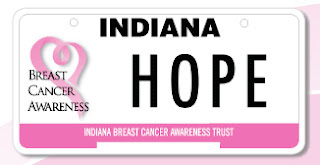 Each Indiana Breast Cancer Awareness plate sold generates a $25.00 donation. For more information on IBCAT, visit breastcancerplate.org.